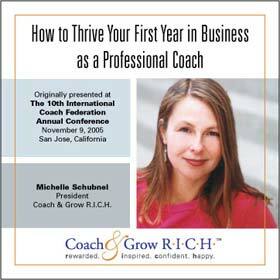 Create a successful coaching business! Originally presented as a half day workshop at the International Coach Federation 10th Annual Conference, this engaging, inspiring and content rich training includes step-by-step guidelines, lively audience participation, helpful role plays, real-life case studies, specific examples and concrete action steps. 3+ hour MP3 audio training CD based on the proven, step-by-step Coach & Grow R.I.C.H business-building system. 22 page handout that provides added details to each topic (delivered electronically). A complete transcript of the training, making it easy to learn and use the marketing and sales scripts (delivered electronically). The marketing strategies proven to produce results, and which ones just waste your time. What to do in a “free coaching session” so more people become clients. 3 things that must happen before someone will say “yes” to your coaching. People thinking about starting a coaching business, who want to understand what it takes to build a successful coaching business. New coaches, who want to learn and implement the four Keys to Success as they begin building their business. Established coaches, who need better results from their sales and marketing efforts. Mentor coaches, who want to be more effective in supporting their clients around getting clients and building a thriving business. This training is easily a $497 value. However, you’re not going to pay that much. As a thank you for being here, we’re making the CD + Instant Access Available for ONLY $149 or you can just get the Instant Access for ONLY $79!